These easy to grow vintage flowers are making a comeback in popularity for the flower garden. I’ll show you some of my favorite annuals, perennials and biennials for an old fashioned flower garden. My grandma died when I was about 7 (way to kick it off with a downer there, Pam), so there’s not a whole lot that I remember about her. But I do remember her love of flowers. She was an avid gardener. Her backyard was FULL of flowers. Lots and lots of flowers. But not the impatiens and wave petunias everyone and their brother grows today. They grew different flowers back then. Here is a list of some flowers that may have been in her garden. Or your grandmother’s garden. They are all old fashioned. Or vintage. Or classic. Whatever you want to call them, they would look AWESOME in your garden this year. Nothing shouts COTTAGE GARDEN more than a cluster of Hollyhocks along a brick wall or picket fence. Although they tend to be a perennial with a shorter lifespan (normally only lasting 2-3 years), hollyhocks are totally worth growing! Besides, they reseed themselves easily so you will have new hollyhocks popping up to replace the previous ones. 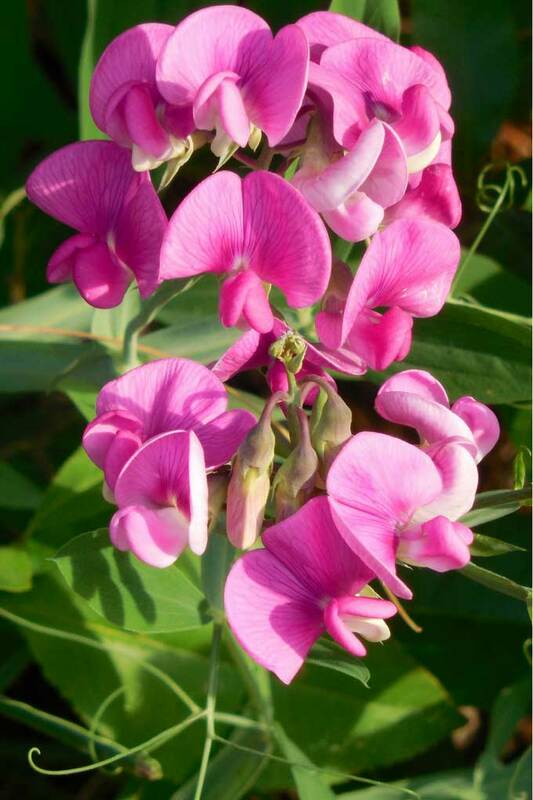 Sweet peas have a Heavenly scent that will remind you instantly of your Grannie’s garden. Grab a bunch of them and place them in a mason jar for a lovely bouquet for your kitchen table. I am a firm believer that EVERY cutting garden should have at least a row or two of these flowers growing in it. Period. The flowers smell like grape Popsicles. Some say they smell like cherry pie and some say they smell like vanilla. I think they are nuts. Clearly grape Popsicle. Clearly. Although I love the bushiness of this plant and the beautiful purple flower clusters, there is some thought that it may be toxic to dogs if ingested, so please keep that in mind if you have a plant eater in your midst. Gorgeous spider like flower blooms that grow on super sturdy long stems. 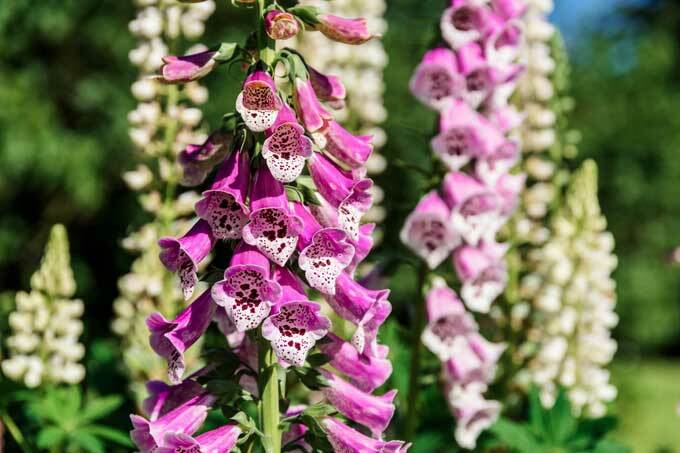 Now, the bottom half of the plant is nothing to write home about, so it’s best to plant them to the backs of your flower beds with lower growing plants in front of them to cover some of that blandness. These can easily be grown from seed too. So if you can get rid of your arachnophobia, this is a great plant. 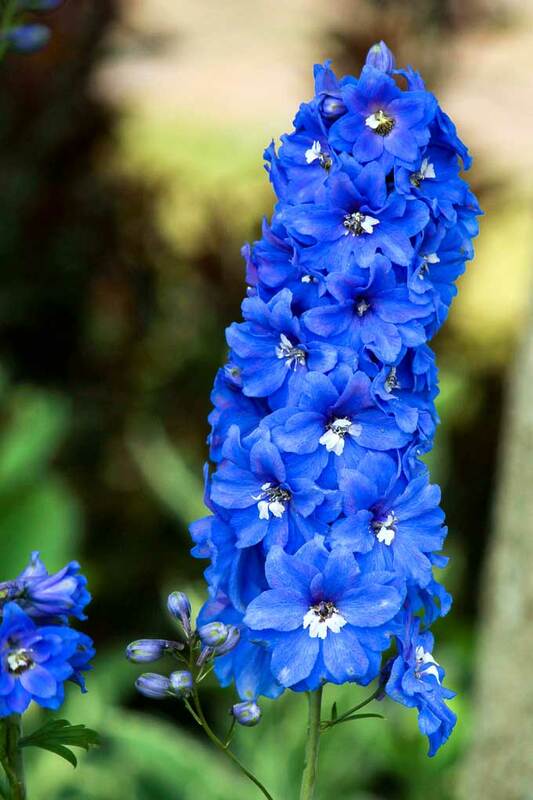 Delphiniums have gorgeous spiky blooms that poke out over the top of the garden. 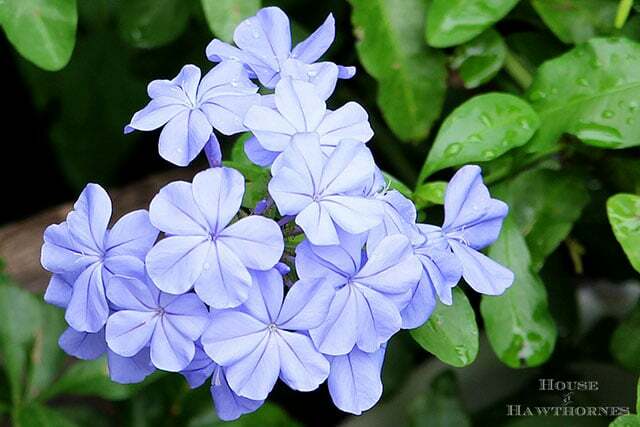 Although commonly seen in shades of blue, they can also be grown in lavender, white, yellow and red. If you deadhead the initial blooms, they will bloom again. Hate to be redundant on the gorgeous thing, but . . . gorgeous blooms! They sort of resemble phlox. Grows as a perennial for all the lucky people in the deep south and will look like a shrub (because technically it is a shrub). Can grow as an annual or in a pot for all of us who live in the world of four seasons. Foxtail is a beautiful flower for your garden with dramatic trumpet shaped blooms. It is a biennial, which means it has a 2 year life span, will require staking and may be poisonous. But hey, everyone has their downsides! Actually I have never had an issue with the toxicity of this plant, but if that concerns you please read up on it before planting them. BTW, my friend Pamela at Flower Patch Farmhouse has a whole article devoted to her love of foxtail and has some gorgeous photos of them in her cottage garden. The flowers on these plants are not important. At all. In fact, I pluck them off as soon as I see them. Why grow them then? The foliage!!! 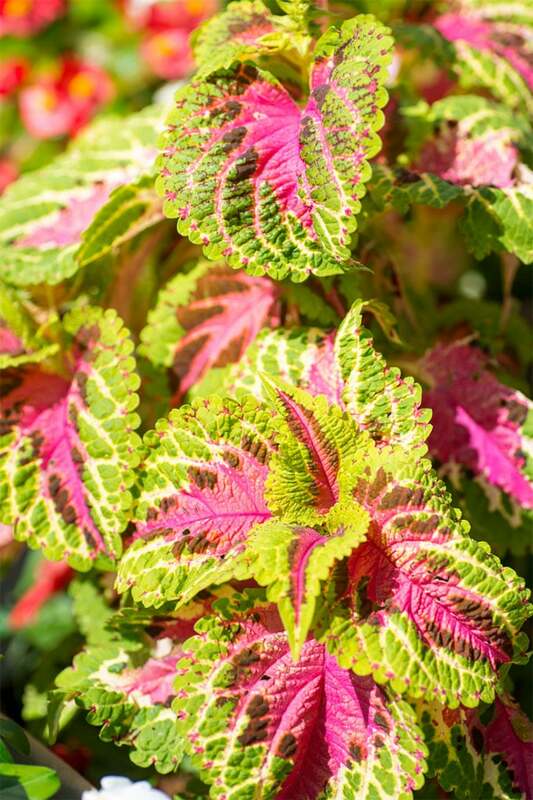 To die for foliage that gives a nice contrast to a shadier area of the garden. And now that I’ve said that, I’ll have to apologize for the sad coleus photo. I took that very early in the season before they had a chance to grow very well. Trust me, they look great once they’ve grown together and create a sea of colorful foliage. 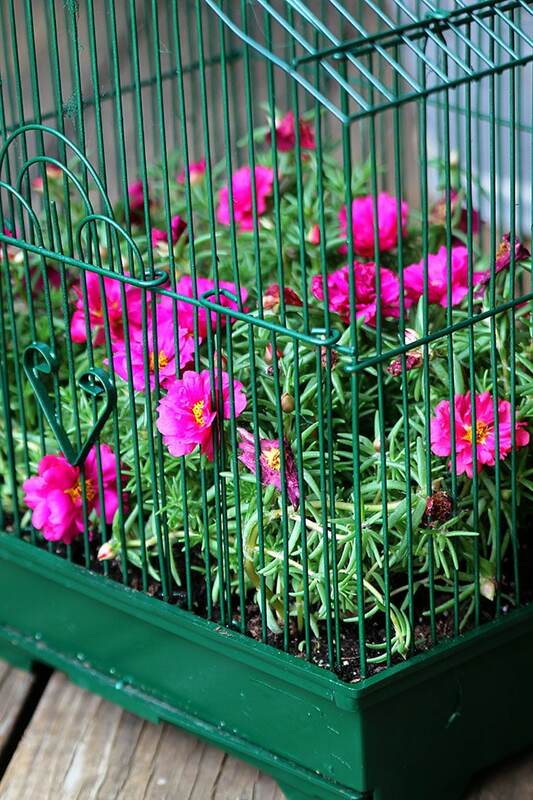 These are actually a succulent, but with masses of flowers (as seen in my How To Make A Birdcage Planter article). And they thrive in drier conditions. Not in your dryer, just drier soil. Just want to clarify that. We don’t need any plants bouncing around your dryer. It’s bad enough they’re locked in the parakeet’s cage. Another one grown for foliage only. I strongly believe that every garden should have at least one of these. They’re different. They’re exotic looking. They’re easy to grow. Enough said. Are there any plants you would add to my vintage flower list? Are there any ones that you remember from your grandma’s garden? Thank you for that list. I love vintage everything, including plants. One I specifically remember growing up in Northern Illinois was the hollyhock with it’s tall stems and rainbow colors. They came in every color of the rainbow is what I mean. The bees seemed to love them too so it’s good for them. I love hollyhock! I’m going to have to add that to this list if I do a Vintage Flowers Part 2! You’ve shown me some flowers that I wasn’t familiar with, Pam. 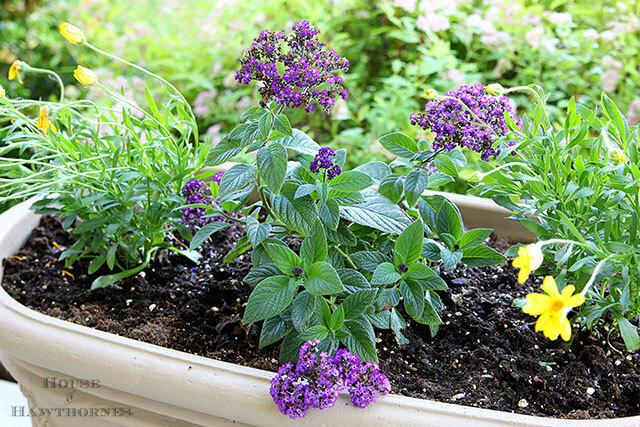 I’ve never planted heliotrope or plumbago, but now I’ll be looking for them next planting season. Marigolds and Annabelle hydrangeas grew in my baba’s garden. I even transplanted some of her hydrangeas into my flower beds at our previous house. I wish I had thought to dig some out before we moved, but I do have Black Eyed Susan’s that came from her garden and I’ve shared the seeds with all of our family members. My mother didn’t plant many flowers, but she always had a patch of moss roses next to the garage. Thanks for the trip down memory lane and happy gardening! I recognize some of these, and indeed, just planted half a dozen portulaca. I remember my grandmother having 4 o’ clocks. They smelled heavenly and opened in the afternoon. They come back year after year. I have so many things planted in my yard to remind me of my grandparents (because papa loved to garden too) flowers and shrubs. Thanks for a great blog. I do remember the four o’clocks, but most of all the Sweet Williams, nothing smelled better. I would love to have a big colorful patch. 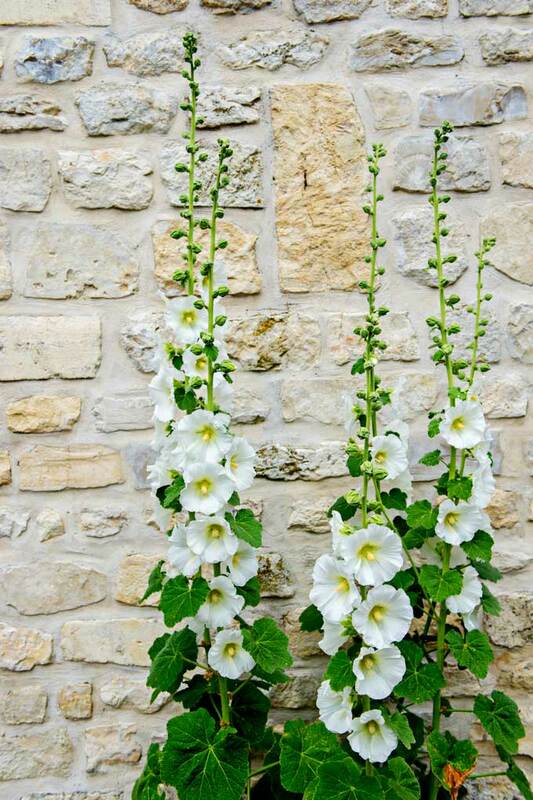 I keep meaning to plant some Hollyhocks, they remind me of my childhood home. Just one more to mention, it was my grandfather’s pride and joy – the dahlias, especially the large dinner plate size. There was always a rush to get them cut when the first frost was forecast. Aren’t memories great? I “do” plumbago in containers (not warm enough here for it to be perennial). 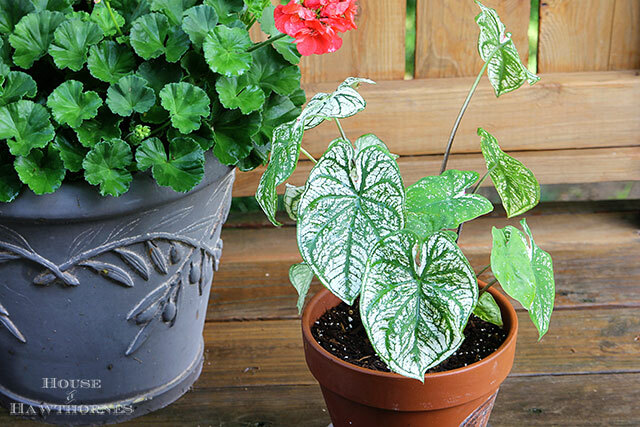 I have coleus, but I’m not crazy about caladium. My grandmother had TONS of daffodils, which gets so ugly by June. She also had roses (I have one from her rootstock) and ferns and hydrangeas, which I also have. Good information! Nicotiana is a wonderful flowering annual. Not the short ones they sell which don’t smell, but the old fashioned ones that are really rather ugly plants. The plant is related to tobacco plant, hence the name, but the little white flowers smell like heaven at night. So, they are tall, ugly but with beautiful smelling flowers. The powers at the big seed/plant companies sometimes “decide” what we should want. A great? example are beautiful roses with no smell. Roses with no smell? Crazy. Hollyhocke for sure and iries of many colors. I drove by an abandoned farm house with some striking white iris. If I had a shovel, I might have stopped, though would that be stealing? I think if it’s abandoned then it’s all up for grabs 🙂 OK, so maybe not the front door, but plants would fall under that category. My Grandma loved sweet peas and hollyhocks! I totally forgot about sweet peas! I used to love the smell of those! I love this post! Whenever I see Hydrangeas, I always think of my sweet grandma Gloria. She had the most beautiful bushes of them on the side of her house. Now that our dogs are over the whole digging up of the things we plant business, I am finally going to get some! No more “only hanging baskets that the dogs can’t reach” nonsense going on around here! Have a wonderful day, Pam! Oh, I love hydrangea. I only have the newer ever-blooming varieties, but I want to get some of the more traditional ones. Glad you’re past the dogs eating plants phase! Oh, I love all these! My grandmother also loved iris, daffodils and pansies – I remember her explaining to me about their sweet little faces. 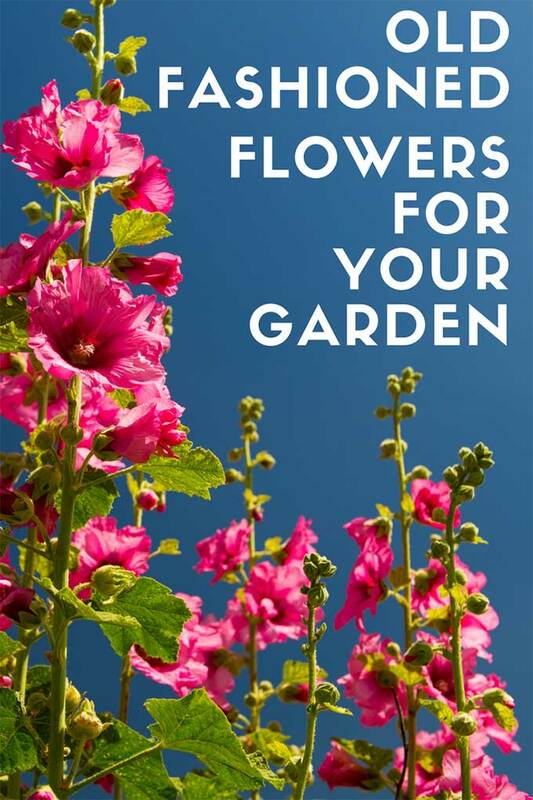 I love to plant hollyhocks, delphiniums, roses, cleome, cosmos, plumbago – such a pretty shade of blue, verbascum, coleus – I could just go on and on! Since we moved here to Ohio I’ve got so much work to do! Slowly but surely. I love your portulacas in the enamel basin. not the others. Love the three I know. I love all the old fashioned flowers and have quite a few of them in my country cottage garden. My heliotrope’s are coming up all over. I even have white ones. Thanks so much for sharing and happy gardening. I grow many of these. I used to grow Bachelor Buttons. They remind me of my Grandma. Love all of those! Let’s see: irises, bachelor buttons, cypress vine, marigolds, day lilies ( the old fashioned orange ones), hollyhocks, antique roses (great fragrance! ), amaryllis and crinum lilies(sp?). I remember stock and carnations. I my job as a ‘helper’ to deadhead them. Both were very fragrant. I love your flowers, and it’s nice to see some of those old fashioned varieties again. I too love some of the old fashioned flowers, and I’m growing a few varieties now. Hope you have a happy week, my friend. I haven’t thought about Spiderflowers in years. I need to remind Chris about that too. Love the red-lined basin for a planter. My top pick would be roses. My maternal grandmother had the most beautiful ones I’d ever seen. People actually used to walk by her house and comment on her roses and how beautiful they were. I was lucky enough to have my Grandma until I was about 40–so I have so many memories of her. She was an avid gardener–until the day she died! Her ashes are actually in her garden now. She loved every purple flower there is and the smell of Star Jasmine always reminds me of her. Enjoyed your post–may have to get some of those flowers. How is Max? They are all beautiful flowers! Old fashioned petunias, four o’clocks, zinnias, cannas, hydrangeas, gladiolas and daylilies are the ones I remember most. But, I just love moss rose and wish I had more sun for them! Wow, such gorgeous flowers! I think the heliotrope is my fav! Thanks for sharing it. Enjoyed your post and the trip down memory lane. I remember growing up with grandma and my parents loving to garden. Daddy’s favorite flower was zinnias and he grew the most beautiful ones. One of my earliest memories was mother letting me pick a bouquet of nasturtiums from her garden. This became a daily task – which I dearly loved to do. We always had a pan full of cheery rose moss blooming too. Hollyhocks, 4 o’clock so, Sweet Williams…the list goes on. Thank you for your lovely post. Love this post. My mom was from the North and not a vegetable gardener but she loved her flowers. One of her favorite flowers aside from what you have listed, was Lily of the Valley. She carried it as her bouquet when she got married too. They are shade loving. I can remember them planted around the one side of our house that did not get much sun. One of my favorite flowers are Peony’s. I love their scent and the big, beautiful blooms. Iris are also an “old fashion” flower with beautiful blooms and varieties. I love old fashioned flowers as they remind me of my late grandma and her farm in rural Ohio! I had five o’clocks planted in my garden for many years then they just died out. I love how they bloomed in the evening when things were dying down for the day. I might need to find some packets and try growing them from seed again. I am with Lynda…as I too am a Northerner…and what my mom had growing were huge Peony’s along a back fence, and Lily of the Valley along a shady part of the house. And huge Lilac bushes too. Both sets of grandparents lived in the city, so they did not garden…so my memories are just of my mother’s gardens. Smelling these flowers always brings me back to my childhood. Thanks for the ideas Pam! I love your blog. Hey Pam: How about lupines, which also will re-seed, dianthus (pinks). Both are perennials. Another annual is the cosmos. You can add these to your list. I can’s wait to get out and dig in the dirt! I have several, well many, of my mother’s iris. I love them and think of her when they bloom. In Ohio it’s usually May, but in Texas they were early April. I separate them every two years,passing them on to family members and friends. So delicate and beautiful to start the spring season off. I have always loved hollyhocks. And sweet peas and coleus. My grandmother had a mass of lily of the valley growing along the side of her house, so they remind me of her. Now we have a delphinium alongside our garage. But my most favorite flower is peony. I wish we had one. Thanks for the pretty pictures and all the info. jam packed with lots of information. Such an interesting and timely post Pam. Now that Spring has sprung in the Deep South, everyone is thinking plants, but it’s still best not to plant until May b/c we can have a cold snap, which is happening as we speak. Love your flower list! 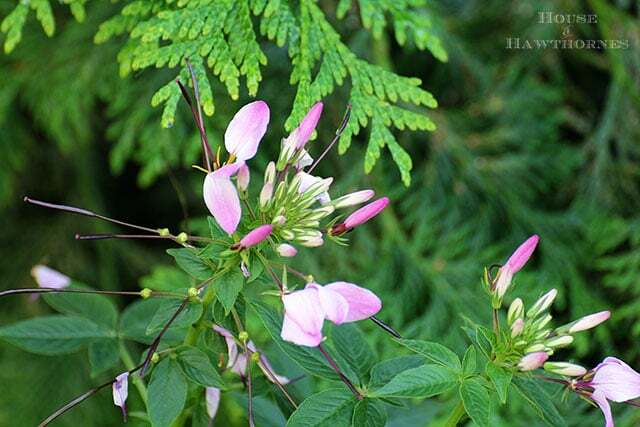 I never knew spider flowers were called “heliotrope.” Always called them just spider flowers. I love them and hollyhocks too. I haven’t grown them in several years. We always have 4 o’clocks, but they will take over. Easy to grow though. I also love day lilies, red cone flowers, and iris. Unfortunately, the iris only look good during blooming season, and also unfortunate that it’s a lot of work to divide them. I remember my Grandmother having a cottage garden, and I’m sure she grew a lot of these lovely plants.